Have a wonderful time in Bath and a lovely Christmas and enjoy the books, I heard they're both great! Oh, fun visits this month. 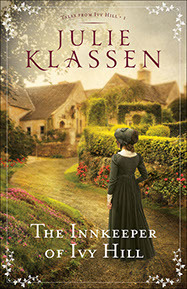 I just read The Innkeeper of Ivy Hill for the tour and it's another good one by Julie. Hope to catch up on a few other holiday reads, too. Have a great time in Bath, Ceri. Don't spend too much! I've had a sneak peak of Victoria Kincaid's book and I think you'll definitely enjoy it. I'm hoping to finish reading three books I have on the go right now: Villa Fortuna, Darcy's Hope: Beauty From Ashes, and An Obstinate Headstrong Girl. There's also two beta projects that I'm working on with two of our JAFF authors which I'm sure everyone will like very much indeed. Yes, do enjoy yourself. I have read Joana's and have read excerpts about the other two...will put them on my TBR list and hope to at least get the Christmas one in this month. Happy Christmas, Everyone. Ceri,hope your shopping expedition to Bsth went well and that you're not penniless as a result! I've already had the pleasure of reading Joana's tale,so I think I'll delve into Cat Gardiner's Villa Fortuna and A Moment Forever. I'd really love to get those two books read. Happy holidays,Ceri,and to all of your readers.